The light from our headlamps bobbed along the San Joseph Bay beach and danced across the crests of the rippled sand. It was midnight by the time the five Island Mountain Ramblers raced through the shadowy forms of the sea stacks, trying to beat the incoming tide around the headland. The waves lapped at our boots as we scurried between the rocky headland on our way to meet the final member of the group, Rishi, at San Joseph Bay’s Second Beach. Although I’m no stranger to starting hikes in the dark, normally it’s just before first light and not in the middle of the night. This was a special trip, and I could feel the adrenaline flowing as we walked–I was excited! Even in the dark we kept a quick pace and we were at the San Joseph Bay’s second beach in a short time. Our late start was to facilitate an early start the next morning. Cape Scott Provincial Park is a long way from Nanaimo and this particular trip requires careful timing. 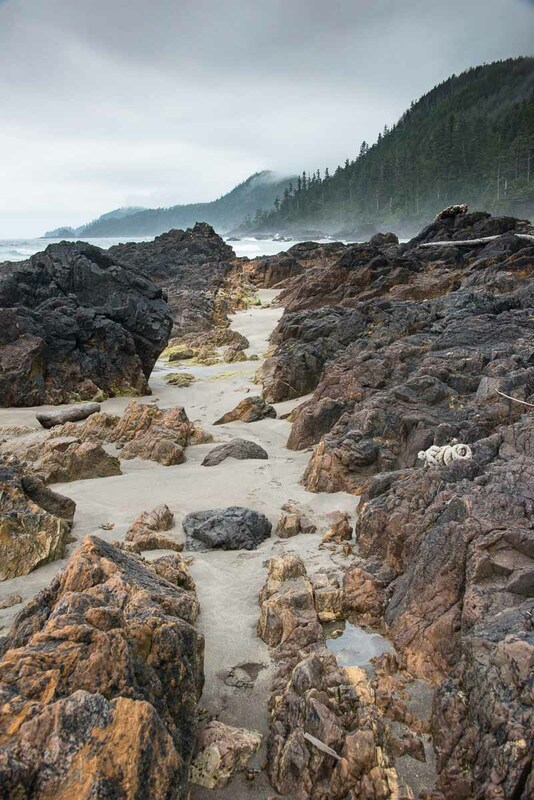 We had given careful consideration to the tides when planning our traverse of Mount Saint Patrick to Lowrie Bay, both inside Cape Scott Provincial Park. There are two cut-off points, and only one has a high-tide route. The biggest obstacle is getting across Sea Otter Cove; at high tide, the cove is flooded and the two streams that flow into the cove become impassable. I’m grateful for my club-mate who shared her GPS data with me; without it, I would have made some critical timing errors! Thanks to her data, we were able to time the trip well. We had an early start in order to make the tides; we were walking by 6:30 am. Even at the early hour, the day was warm and muggy. 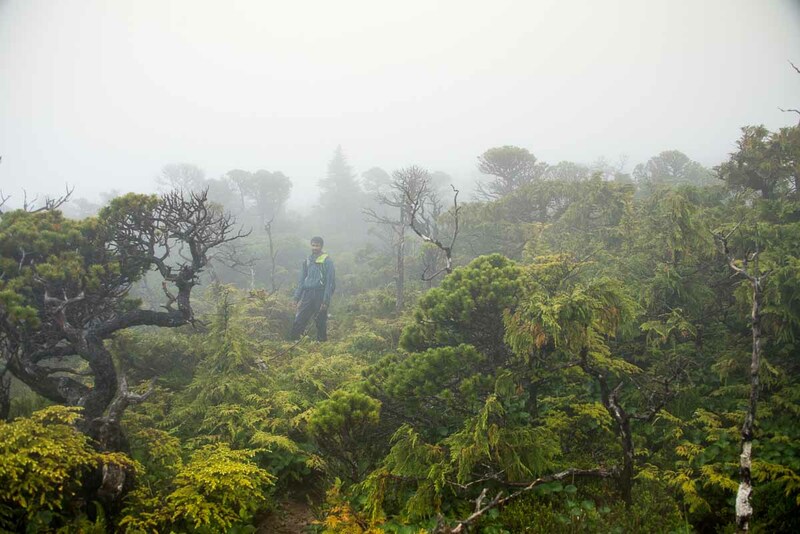 Before stepping onto the steep, twisting trail, I paused to consider the heavy cloud that obscured Mount Saint Patrick’s relatively low summit–we would definitely be walking in the clouds. We were already damp as we passed the “Dangerous Route” sign which marks the trail to Mount Saint Patrick and points beyond. Within a few minutes of hiking, rubbing plants, and hopping over minor obstacles, we were soaked. As we approached the peak, Rishi took the lead and gained the Mount Saint Patrick’s summit first. This odd summit was engulfed in a thick cloud. 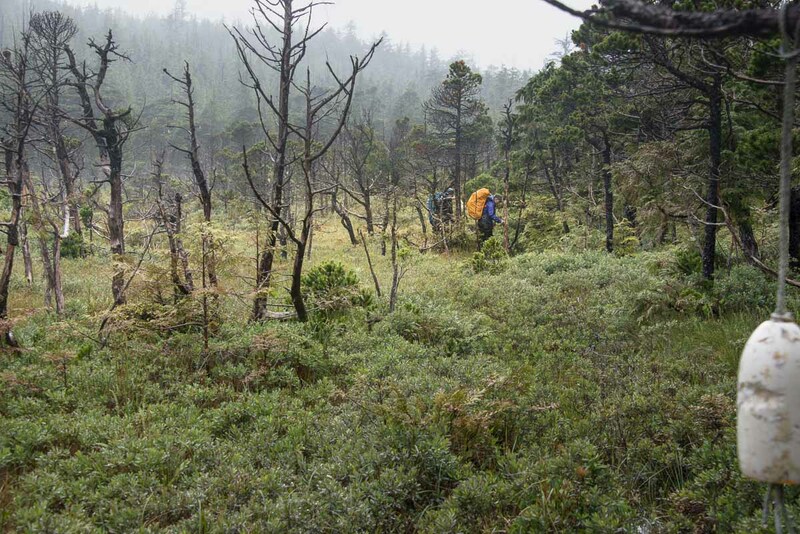 The terrain, somewhere between bog and low alpine terrain, is uncommon on Vancouver Island; the loamy ground hosts a sparse collection of stunted, twisted pines, and lichens encrust the exposed rocks. Lacking a view of the surrounding landscape, it was easy to imagine that we were well above 1400 metres, rather than the reality of a mere 420 metres. As we descended, we followed a small trickle of water down the narrow, muddy trail. Crouching below hanging bush, we stepped into a series of mud terraces. With each step, water and mud gushed over the edge and into the puddle below. Progress was even, but slow. For the most part, the route is simple muddy terrain, but a few notable sections still make me chuckle. 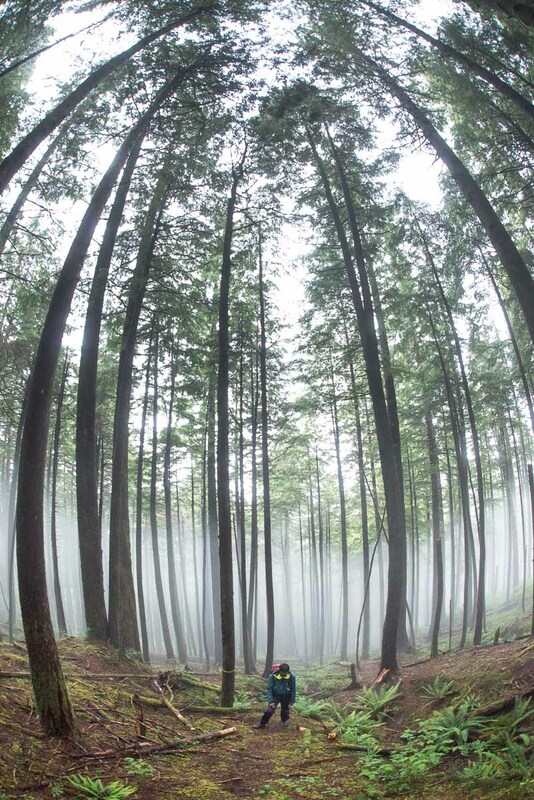 The most memorable obstacle is a jumble of narrow, living trees that cross the route. Too high to easily hop over, too thick to push or pull on, too low to easily crawl under, it took a puzzling combination of moves to navigate through. We each took our own special route; I watched Rishi play ‘Twister’ as he moved through the obstacle, and hop down into the mud on the opposite side. About two hours from the summit, we arrived at the creek crossings. They posed a special challenge, but we timed our hike well and the tidal waters had receded, leaving only 12-20” of water. 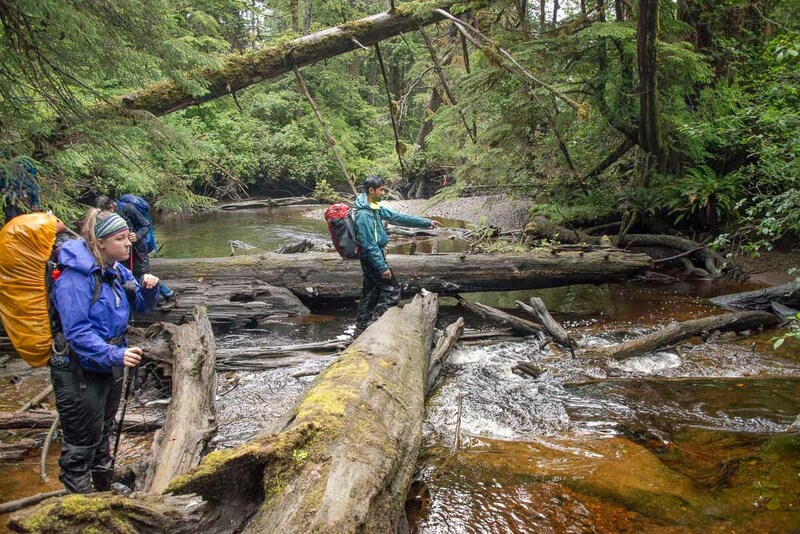 Many of us failed in our attempts to cross logs, hop gravel beds, or walk over wet rocks–we ended up with soakers! Somehow, even in our soaked state, we managed to laugh about the route we came down. 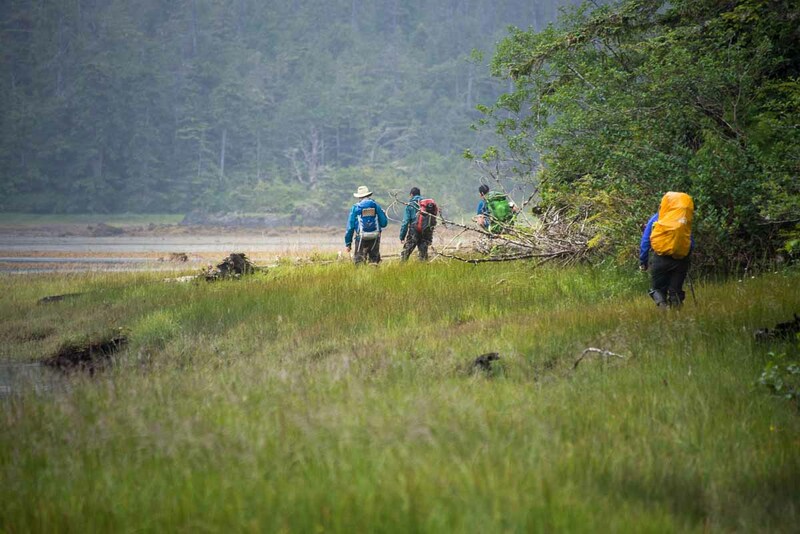 We had only the pleasant walk along the grasses of Sea Otter Cove, and the bog between the cove and Lowrie Bay, still remaining. Sea Otter Cove is a feast for the eyes. By its very nature, the cove provides fantastic mooring for boats that want to escape the rough waters of the north coast. As we walked, we could see a moored 30’ sailboat, shrouded by the mists and rain. I could imagine the first white man to explore the area, sailing the Sea Otter into the cove and making land in a dory. As we walked the flats, we could just make out the start of the route between Sea Otter Cove and Lowrie Bay. The bog was my favourite section, and also the easiest section, of the day’s route. We continued following the flagged and churned route through the twisted pines. Despite being wet to the bone, a smile was plastered on my face as the sounds of the shore of Lowrie Bay became audible through the trees. We pushed through one last wall of salal just before the beach, a final attempt by Cape Scott Provincial Park to block us from reaching Lowrie Bay. When I hit the beach, I was speechless. Even through the mist and surf, the beauty of the place was apparent. 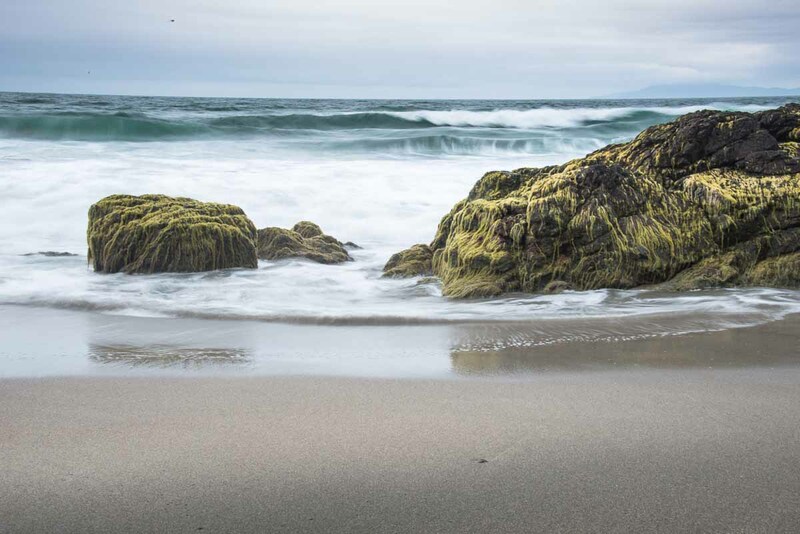 Lowrie Bay is exposed to the sea, and the landscape bears witness to it. The place is rugged but not ravaged. The low-hanging mist created a sideways rain that collected on every surface it touched: my jacket, camera case, and even my eyeglasses. We arrived at the beach early in the afternoon, and by early evening the mists lifted. Lowrie Bay was illuminated in the ethereal light of the sun as it tried to burn its way through the clouds. It created an even, shadowless light that provided suitable mood for our collection of north coast images. By this time, we were rested, ready to walk down the beach and explore the north and south sections. In better conditions, the soft sands and surf would be inviting; today, they were cold and foreboding. 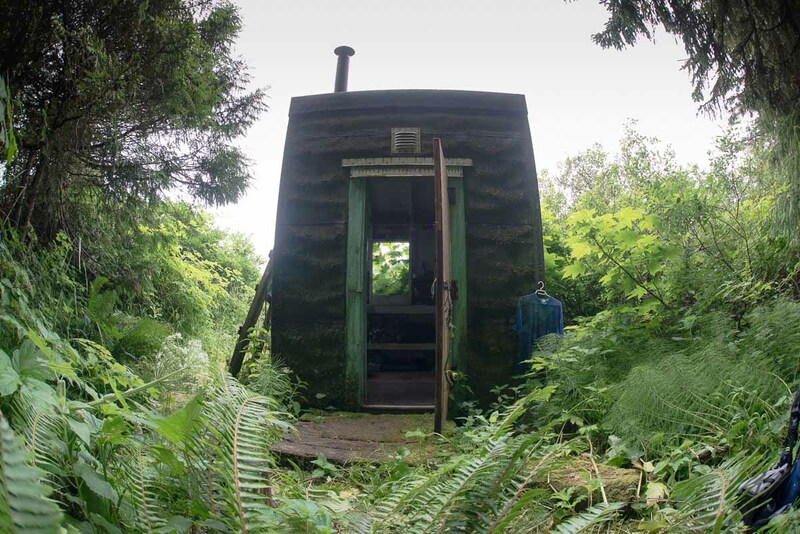 The highlight of the day was exploring the small cabin to the south of our camp! It’s a simple box, with a steel fireplace and two clean bunks. We each took time to read the notes written on the walls by adventurers, and as we left we turned off the light switch; the person before us left it in the ‘on’ position! After completing our beach walk, we built a fire and ate our meals as we sat talking about the trip. There was no hope of drying out by the fire; the moist, humid conditions persisted throughout the evening, and rain came in the night. I woke around 2:00 am to the patter of light rain on the fly, but by 8:00 am the rain subsided to the same heavy mist that we saw on the first day. Again, heavy droplets of water hung in the air, glazing everything in a slick flow of water. We were all wet, our gear heavy with the extra weight of the water. We weren’t keen to spend the day on the beach, so we headed back to San Joseph Bay. 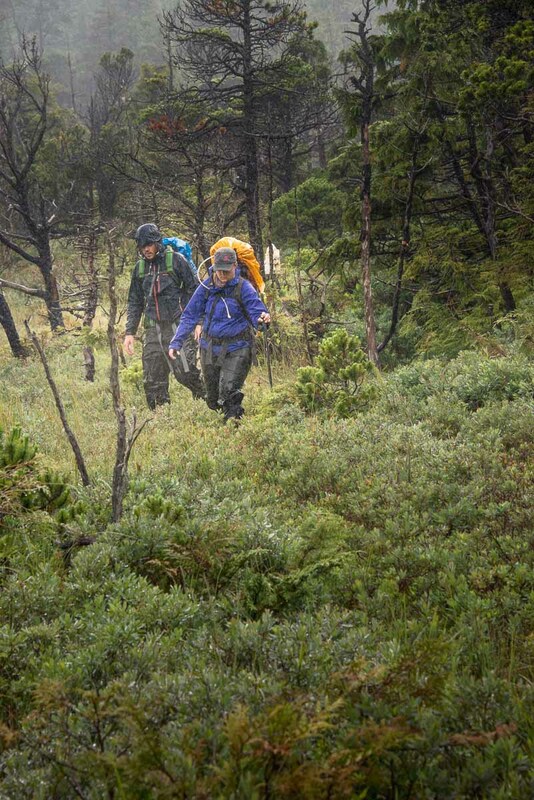 Reaching the final 100 metres to the summit of Mount Saint Patrick, the atmosphere changed. 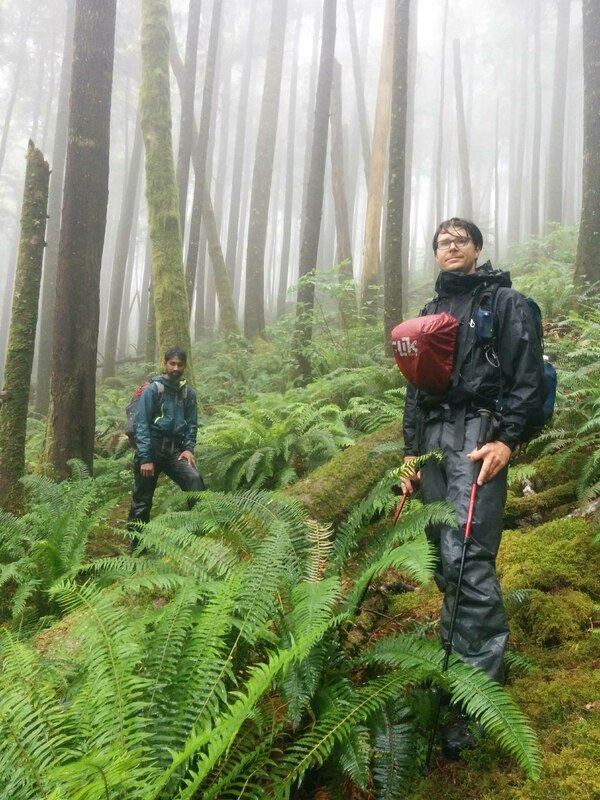 We walked through a real Vancouver Island cloud forest: heavy cloud continued to deposit water everywhere, and now a light rain started as well. 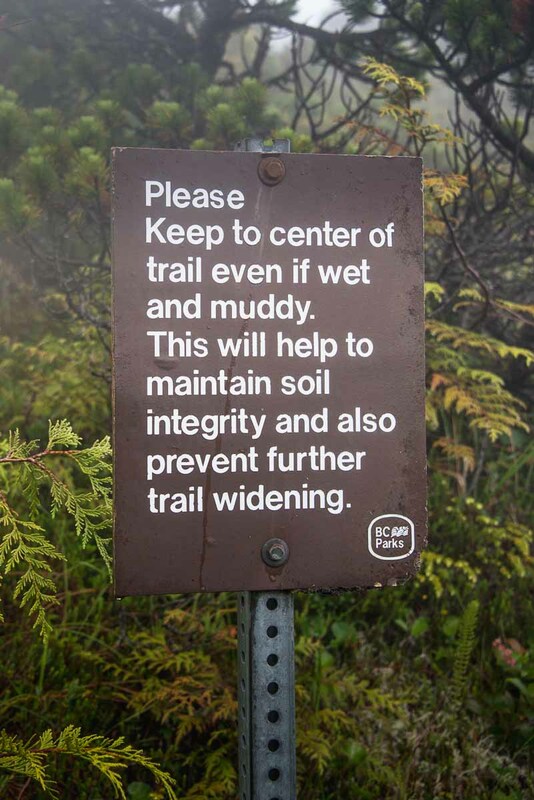 The muddy trail was a small sluice of mud and water that poured down the mountain. Water even trickled down the inner sleeve of my jacket – I couldn’t possibly be any wetter! When I lead a hike, I gauge the psychological state of the group. Remarkably, the group maintained a cheerful attitude about the tough situation, perhaps in an effort to put a best foot forward. Beth was particularly cheery, and we were all grateful. I was feeling the toll of the effort. Rishi was, too; he asked me, “Do you ever reach a point in a trip when you say to yourself: ‘Why am I even here?’” I know I was asking myself the same thing. I’m sure you are making the connection between the title of the report and the conditions we were walking through. The best description we came up with was that we walked down a bog from the summit of Mount Saint Patrick. More accurately, it felt as though we were descending a terraced series of tiny rice paddies. The trail was mostly a long series of puddle chains, and each step down was into a puddle of water held at bay by mud and roots. Arriving back at San Joseph Bay, I brought up the touchy topic of skipping the final night on a rainy beach. Not one person objected – in fact, everyone was happy to get the heck out of there! On the way back to the car, Rishi made a wager with Michael for a can of Lucky Lager: by the time we made it back to the highway, Rishi predicted, blue patches would be in the sky. As we sat in the Scarlet Ibis enjoying a beer, and fish and chips, Rishi won the wager. Blue patches and sunny breaks fought through the clouds that had followed us throughout the weekend.